The Queen of Teen Fiction: Cover Reveal: Midnight by Alexandra Lanc! Cover Reveal: Midnight by Alexandra Lanc! I'm pleased to be able to share with you guys the cover for Alexandra Lanc's brand new novel, Midnight! Life has always seemed impossible for IxBryn Rowan, and it's about to get even more complicated. IxBryn is a Knight Blood, an immortal human rendered by science to bring about harmony between the two races of Earth, the humans and the vampires -- at least, that was the plan. A terrible tragedy occurred, and IxBryn is now the only surviving Knight, hunted for the potency of her blood, which will render any Immortal nearly unstoppable for a time. With nowhere left to turn, IxBryn makes her way to Variance, the most prestigious and important City on Earth, to stay with her cousin Bristol, the only person alive who truly understands her, and in turn stumbles upon a secret war breeding within the shadows -- a struggle in which she soon becomes the prize. With danger at every turn, IxBryn may have to learn to rely on those who appear untrustworthy -- even the labeled sociopath Zarrod Kingsbury, an Ancient vampire, and one of the Elite, who has interests of his own. 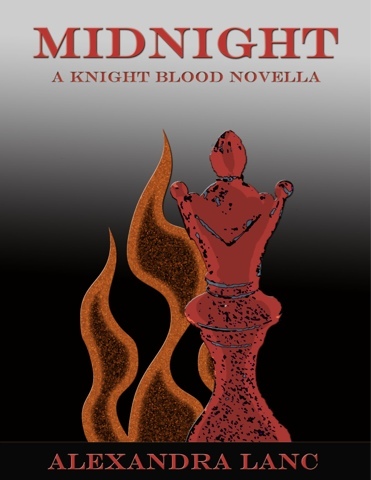 The first novella in the Knight Blood series, Midnight introduces readers to a parallel Earth, where vampires roam free, fate is never concrete, and where home can be found in the strangest of places. The book sounds awesome so please make sure you check it out and add it to you 'To Read' list on Goodreads! Alexandra is a New Adult and Young Adult author who loves writing Fantasy, Science-Fiction, and traditional Horror stories (though she’s known to dabble in Contemporary and Poetry, too). She started writing at a young age, and is inspired by fellow writers (hats off to Eoin Colfer, Ridley Pearson, J.R.R. Tolkien, C.S. Lewis, Madeleine L’Engle, and Jeanne DuPrau), her writing friends, and her dreams. She is currently working on many series and stand-alones, most notably the Snowflake Triplet, her YA Fantasy/Christmas series, the Phantasmagoria Duet, her NA Fantasy series, and of course the new NA novella series the Fleur Passages, later to be sewn into one book, where readers have a say in what happens next through voting! Alexandra is also an artist (her art is featured on her book covers), and a screenwriter, a Whovian, superhero fan, and all-around geek who loves old videogames. Alexandra lives in Florida, USA, with her family and calico cat, Sanura.